Sidewalk “Honk for Life” campaigns in the dead of winter never fail to impress passers by, especially if the campaign involves young, smiling boys ankle deep in snow. Click here to get more information on future camps. 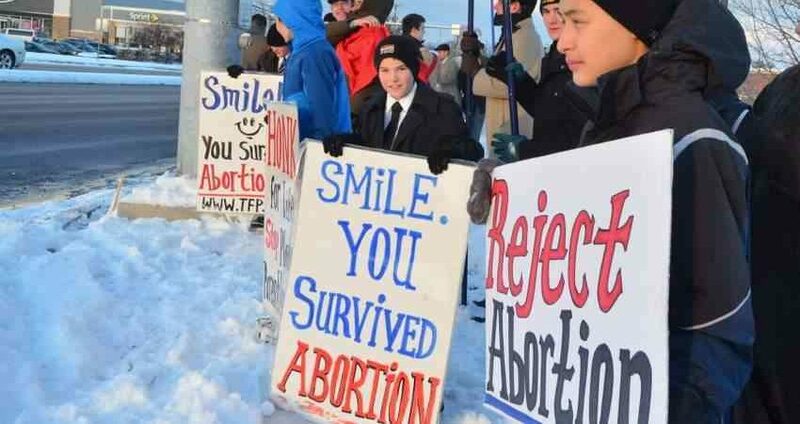 Disregarding the Arctic chill, dozens of Catholic boys gathered at Colonial Commons in Harrisburg, Pennsylvania, to demonstrate their love for God’s Law and defense of the unborn. Their faces were red from the cold and they stamped their feet to regain some feeling from the bone-numbing cold. They were living the spirit of Chivalry, and happiness shone on their faces despite the adverse conditions. It was a TFP Call to Chivalry Winter Camp that brought these young men between the ages of 12 and 18 together for a common ideal: Spend the last days of the year in prayer, make good friends, learn about the Catholic faith, and defend moral values in the public square. The theme of this year’s camp focused on the invocation of Our Lady from Scripture, Virgo Acies Ordinata. This title of Our Lady is from the Canticle of Canticles, “Who is she that cometh forth as the morning rising, fair as the moon, bright as the sun, terrible as an army set in array?” (Canticles 6:9). Camp participants learned about Our Lady’s interventions in battle to help her children. Miraculous examples, recorded in the annals of history, such as the Battle of Covadonga (711 AD), the Battle of Lepanto (1571) or the Battle of Vienna (1683) illustrate how men were able to overcome tremendous obstacles and triumph over the errors of their day when they confided in the help of Our Lady. People honked “for the unborn” from their cars. It must have been difficult not to honk, seeing so many boys braving the cold for such a noble cause. When the campaign finished, everyone hurried back to the vans where they thanked the camp counselors for the campaign, followed by calls to “please turn up the heat? I’m freezing!” Campers from Louisiana seemed to need warmth the most, but soon everyone was thawed out. If you also want to defend the unborn like a hero, join us for the next Call to Chivalry Camp.